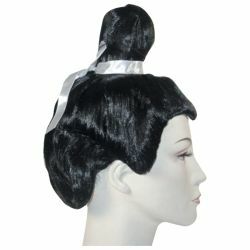 The Molany Upsweep wig is perfect for creating the look of a ninja or samurai warrior. It features long hair pulled up into a thin pony tail bun finished with a white ribbon. The Molany Upsweep wig is colored as pictured.